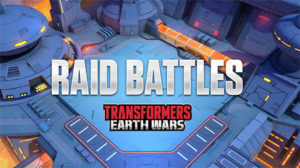 Alliance Raid Battles are the new game mode in Transformers Earth Wars that debuted in late November 2018. Raid Battles feature extremely difficult bases that require your alliance to work cooperatively to defeat them and score points. Accessible through the new Raid Event menu, players can select an available Raid Base to start an attack on that base. The alliance gets Raid points based on the damage done to each specific base. For each Raid Base level only one player can attack at a time, scoring as much damage as possible in 10 minutes of time, then the damage is synced and ready for the next attacker. The event ends when the alliance has destroyed each Raid Base. Here is a look at some of the content on Alliance Raid Battles from Gaming-fans.com. Alliance Raid Battles are Live!